What two-word “destination” does this photo represent? EMAIL your answers and leave a comment designed to either help or confuse your fellow game players. The first contestant to EMAIL me the right answer wins a featured link in my blog which will display until next Monday when we’ll play this little game again. Enjoy. Sigh… I’ve got another one of those answer I love that isn’t right and I’m stuck for something that’s two words. But I’m having fun. Thanks – as always – for the challenge. Never would have solved it without the hint. I like Bill’s answer. Raven — so do I, and I wish I was a smart a Bill thinks I am! Sighing here as well. That Raven is soooooo smart anyway as she wins all the time. Of course she is even more clever than you are and that makes it very hard for us. I’m blushing and undeserving of the compliment. I’m nowhere near clever enough to come up with these, only clever enough to make up an occasional clever answer. Jim — do you know that most of the time I am clueless as to why you guessed the way you did. Who is Joe?! Quilly, I could have sworn that I read here where Raven sent this one in to you. But it doesn’t say that anymore, does it? Mar — you’re on the right path, where does it lead? I forgot all about this last night — and I have no idea this morning. But if something comes to me I’ll send it in. Barbara — I forgot, too! Rosidah — thanks! You have a great week, too! Gosh, now that I see the answer it makes so much sense. Love the pun. Karen — no answer yet, has your caffeine kicked in? Easy-peasy. Which of course means I’m wrong! And I like the new schedule. The old rotating one was still impossible for those of us in the central time zone who aren’t up in the wee hours of the morning or late late late night. Tilden — Jim disagrees. He wants 6 a.m., and 8 p.m. because they are best for his time zone; where apparently everybody in the world but me lives. who is in charge of this game anyhow? Tilden — apparently no one. Got it! Will e-mail you! My first thought has 3 words. 🙁 Guess I’ll have to keep thinking. Stacy — you can send your wrong guess. Often they are better than the correct guesses. Mama Zen — blame Amoeba. if he hadn’t insisted on the first word, we’d already have winners. Come to think of it, both words are represented, just not together. Ok, the background color has no impact I think. 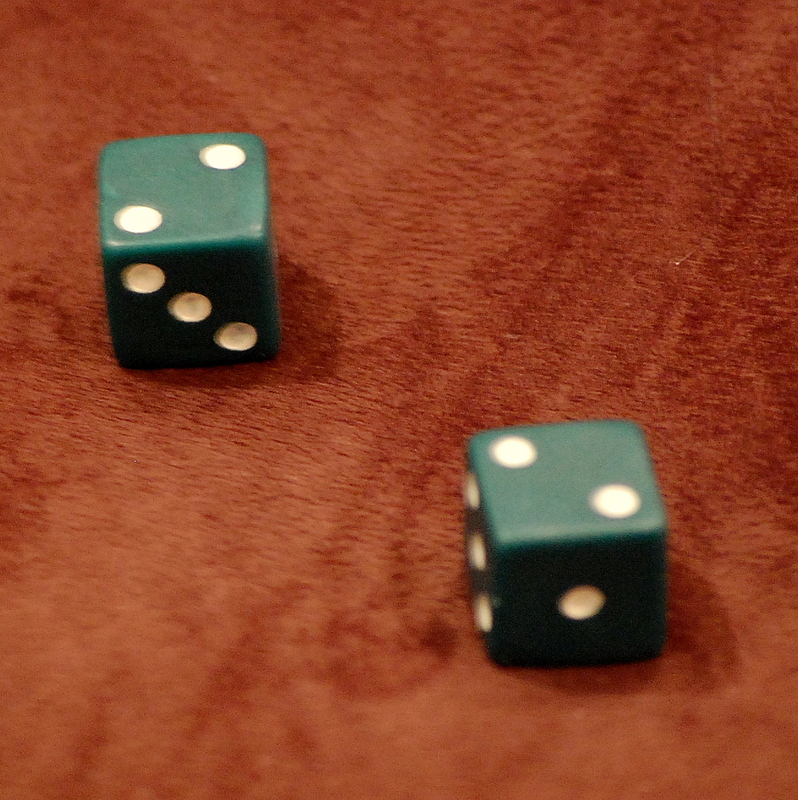 “Pair” of dice didn’t click with me earlier – I was traveling till midnight last night and my brain wasn’t yet unfoggy. I sent I guess this time and if I’m right I owe it to seeing ‘Paradise’. The first word I had. Well, I think so anyway. We’ll see. Carletta — sometimes sleep deprivation makes puzzles easier for me because I don’t have the energy to over-think them. My brain is toast, 8 hours of Orientation on the new job, just can’t think. OH, I have the Quilldancer Assignment #1 ready to autopost for 15 January, at 0001 hrs Eastern Standard Time. Are you going to create a button for it, like Susan has for Microfiction Monday and Thom n Dr John had for Portrait of Words. Just wondering. I just sent in a guess at this late hour, Thought of an answer as soon as I submitted my last comment. Bill — I got your guess and it is cute (and I wish I had thought of it! ), but I think you forgot to check the hint that tells you what kind of answer I am looking for. Even so, I appreciate your playing. I don’t care who wins, I am always excited over who plays. And I protest that it is NOT two-word destination. it is a one word destination. When you added the hint about the direction, I figured that was just part of the name of the destination, as I sent in my guesses. Hmmpff. Linda — don’t tell anybody but I doubt I would get them if I wasn’t the one making them! AND, this one was Amoeba’s idea. I just wanted to do “paradise” but he said that was too cliche. Well, Linda, I desired two pairs of dice (total of 4). But the Q made do with the twolls available. Love, I thought 4 dice would make it even harder for them to come up with “to”.